As bodies get banged up across the organization and the trade deadline looms, the Toronto Marlies have added a pair of reinforcements to help them weather the storm. The team confirmed earlier this afternoon that they have signed forward Rylan Schwartz and defenceman Eric Baier to professional tryout contracts. Both players bring a bit of veteran experience to the team. Baier, who is the captain of the Orlando Solar Bears, is 27 years old and has spent the past month and a half as co-captain of the team. He was also their captain in 2013/14, his first year with the club. Baier was undrafted as a teenager and took the college route to advance in the hockey world. He spent four years at Providence College, where he tallied 32 points in 127 games and was named to the Hockey East All-Academic team in 2009/10. Since turning pro at the end of the 2010/11 season, Baier has spent the bulk of his career in the ECHL, scoring 31 goals and adding 64 assists in 260 regular season games (0.37 points per game). This year, he’s tied his career high in single-season points, scoring 6 goals and adding 16 assists in 37 games played; 19 games fewer than the last time he hit the 22 point mark. 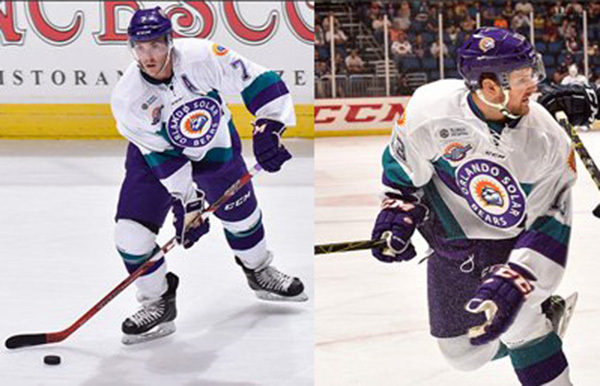 Baier currently leads Solar Bears defencemen in scoring and is fifth on the team overall. Schwartz’s development path is very similar though he’s been a little more successful along the way. After an illustrious Junior A career with the Notre Dame Hounds, who have also hosted former Leafs Curtis Joseph, Wendel Clark, Gary Leeman, and Russ Courtnall, Schwartz also committed to the NCAA. In the first year of his 156 game, 159 point career with Colorado College, Schwartz was named to the WCHA All-Rookie team. From there, he was a point-per-game player before exploding for a 53 point season in 2012/13, making him the top point-getter in college hockey for the year. After his season was over, Schwartz signed with the San Jose Sharks and finished the season with their AHL affiliate in Worcester. He was never able to show the same offensive prowess in training camp or in the AHL, and as such was sent back in each of the following two seasons. Eventually, he was sent down to the Allen Americans, with whom he scored 6 goals and added 20 assists in 22 games. The Sharks didn’t qualify him at the end of his entry-level contract in June, which made him a free agent heading into this season. After months in limbo, the presently 26-year-old signed a one-year contract with the Solar Bears and has scored 14 points in his first 11 games. While he doesn’t come with the same lustre as his brother Jaden, Rylan has shown his offensive talent at multiple levels. Sometimes what appears to be a poor transition could be a matter of usage. The difference in Schwartz’s shots per game is nearly as extreme as Byron Froese’s was before the Marlies signed him out of Cincinnati this year; he’s averaged 2.91 per game with Allen and Orlando while only taking an average of 1.58 in his career with Worcester. There might be something to him at this level if used in an offensive role. According to the AHL and ECHL transaction sheet, neither of the two have been assigned to the Marlies roster just yet, so it remains to be seen if and when either of these two get some game time in. Toronto’s next game is tomorrow night against the Syracuse Crunch. They must have needed to catch up to you on the AHL website – both Baier and Schwartz are listed as being added to the roster via PTOs on January 18th, and are included in the Marlies’ team roster page. Oddly, the ECHL transactions page still doesn’t list them, although neither are showing on the Solar Bears’ roster anymore.